Usually ships within 2-3 days. Allow 5-7 days for delivery by USPS. STAGE 3 Surge/O2 Chip is a fully adjustable, programmed performance control unit designed for all vehicle fitted with ECU, simply wires inline with the factory harness of the IAT (Intake Air Temperature) sensor and into the plug of Oxygen sensor(s) in the exhaust. You will receive crisp acceleration, much more horsepower and torque, lower quarter mile times and surprisingly increased throttle response. Installation is easy, no - special tools or expertise required. Gain +15-40 additional HP, and extremely dynamic acceleration by up to 30 % in contrast to factory engine performance. It works in conjunction with stock ECU and will not affect engine reliability or endurance. Original ECU program is in process, but the signal of STAGE 3 is overwriting it in each microsecond resulting richer air/fuel ratio, accordingly delivering peak horsepower, torque and acceleration. Chips are not uniform and are sorted into several categories according to some operating factors as resistance range of IAT sensor and volt range of O2 sensor, etc.. Improves engine output by up to 20%. Enhances Nm, throttle response, acceleration and torque in the full RPM range. Performance level setting from 0 - 100 %. You can set the preferred higher air/fule ratio than the stoichiometric fuel mix. Unit is not a simple resistor. Pushes up acceleration and dynamism by up to 30 %. Long duration - 10 years warranty. Easy universal 20 minutes installation. Immediate effect even during driving, no ECU learning period. Reduces flat spots or delay time when you mash down the throttle. It does not affect engine endurance. STAGE 3 CHIP/O2 Combo will supply modified signals to your vehicle's ECU. The ECU then adjusts air/fuel ratio and secondarily timing advance curves to new performance settings, in addition this upgrade does have an absolutely outstanding O2 sensor control circuit integrated in the unit. This control panel helps to prevent and stop undesired snubbig of the ECU. Why should ECU regulate air/fuel ratio if we have tricked the signals already by the IAT sensor? The answer is simple, ECU is calculating the air/fuel ratio also per other sensors' signal, and the last and most important respected control step is the oxygen content in the exhaust pipe. If O2 sensor informs the ECU that emission is too high HP-gain will be limited. Our evaluation does not let the Oxygens Sensor delivering fuel rich signal accordingly ECU will not restrict the injection of more fuel. There is no risk of any damage to the engine or electrical parts since the modified sensor signal will always remain within the manufacturer's recommended specifications. The unit works in conjunction with your vehicles ECU and will not affect engine reliability. This worldwide unique Performance Chip Module can even quickly be switched, removed or re-installed at any time. STAGE 1 Surge is great product for intial horsepower gains. STAGE 2 O2 addes additional HP benifits gained from the Oxygen sensors under your vehicle. The STAGE 3 takes the benifit of both and combines it in a single device with even better control and HP gains. When the module does not receive +/- 12V (led does not illuminate), unit is in factory mode. 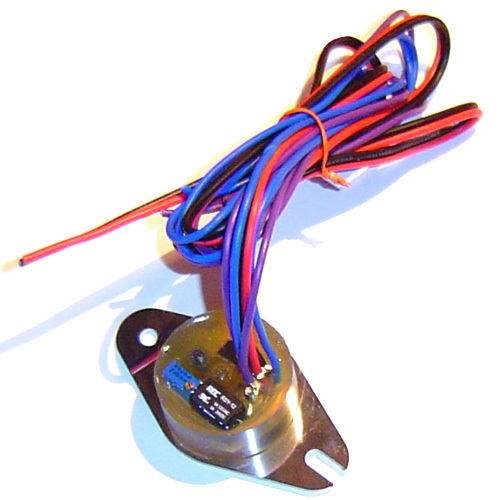 After feeding 12V, you can adjust fuel injection with the help of a simple potentiometer. Shipped chips are adjusted to factory mode, turn the potentiometer screw clockwise to gain more power. HOW CAN WE WARRANT SUCH SPECTACULAR RESULT? We have to suppose that the operation of injection / ignition system is significantly determined on the signals of different sensors as IAT (Intake Air Temperature), ECT (Engine Coolant Temperature), AFM (Air Flow Meter) and OS (Oxygen sensor), therefore when we trick their signals we may regulate effectively engine output. Stage 3 Surge/O2 Combo arranges advance air/fuel ratio, consequently you can use your vehicle as a race car. JUST SWITCH OFF THE UNIT EITHER FROM THE DASH. Installation is easy and universal for each model. Locate the IAT (Intake Air Temperature) sensor in the intake. Cut its signal wire and contact1 the purple wires to the two ends. Direction does not matter. Broach the sensor's signal wire3 according to the following wiring table and contact there the blue cables. Contact the red cable of doubled wire to the ignition battery + 12V, and the black thread to the ground or battery negative. 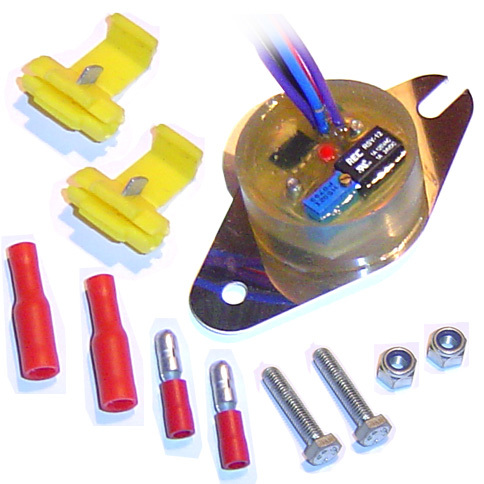 1 For contact you might use the supplied terminals or solder the wires in place. 2 By models where more than 1 oxygen sensor is working, contact the blue wires to the rear sensor(s) as shown on the draw below. If after the catalytic converter you find one sensor only, contact only one blue wire and do not apply the other. If there is two sensor installed in left and right bank, use both blue wires. 3If you solder the wires in place by o2 sensor harness, Hydrochloric acid recommended due to plated threads. BY DIESEL ENGINES WITHOUT O2 SENSOR DO NOT USE BLUE WIRES OF Dyno-BOOST. Turn on the ignition key and red status LED will start to illuminate. Start the engine, warm it and let it run at idle speed. Turn the screw slowly clockwise (right), pumping the gas pedal after each quarter turn. Continue the adjusting until pumping will result a flat pot and engine starts to hesitate. 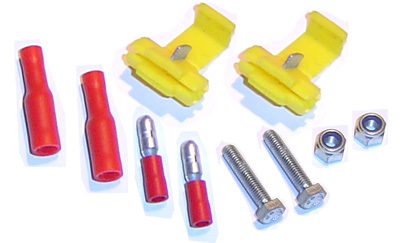 Turn the potentiometer screw slowly counterclockwise (left) until flat pot vanishes. Turning the screw left means less, right means more power. Incidental mismatching of wires by installation does not result any damage. Reset and restart: 30 turns left on the screw. This performance chip module is compatible with most popular and general performance upgrades such as cold air intakes, forced induction kits, exhaust, and ignition systems, racing plugs, pulley kits, grounding kits, etc. It works in conjunction with O2 Sensor performance chip as well. After installation of affordable SURGE STAGE 3 the engine becomes to crisp and powerful. HP and Nm data will be upgraded. Since the air/fuel ratio in injected up-to-date vehicles is regulated by the Electronic Control Unit (ECU) and most factory ECUs are set to maintain a 14.7:1 air/fuel ratio; this is known as a stoichiometric fuel mix, user is unable to trim manually or mechanically this ratio as by early models. This incapability leads to power loss due to serious environment protection laws and rules. To resolve the situation one has to trick the ECU forcing it to modify AFR thus we can retrieve an explosive power without delay just after pumping the throttle meanwhile richening the air/fuel ratio will cause only a moderated reduction in fuel economy due to improved efficiency of the combustion. STAGE 3 SURGE/O2 increases the engine performance by adjusting AFR between 12,7 and 14.7, the utmost performance oriented fuel curves. Ignition timing is adjusted consequently. This unit is controlling injection in multiple ways. First, it modifies signals being read by the ECU, resulting adjustment to the AFR, from the second hand it monitors the signal of O2 sensor and creates intervention into its signal, accordingly the chip module does not let the ECU limit our modified setting of air/fuel ratio. After installation of STAGE 3 your car's dynamics will be much more favorable as before, HP and Nm data will be upgraded. Acceleration will grow dramatically and you will not be surprised after filling the tank: consumption will not grow. Acceleration will show attractive and surprising values, besides an extreme result can be expected when revving up the engine from a low to a higher RPM. The STAGE 3 Performance Chip Control Module was developed and is produced by Surge Engineering autotuning Engineering Ltd. only. Products comes with instructions. Please read above and visit our FAQ section for your vehicles IAT location. Stage 3 Surge O2 Chip Combo by Surge Engineering is a great product to add to your car. If you have any questions about Stage 3 Surge O2 Chip Combo by Surge Engineering feel free to call us anytime and a sales representative will be happy to assist you!